The IBM device would read single strands of DNA as they passed through layers of a microchip. Sequencing your genome is going to be such big business that everyone wants to get in on it, even if they aren’t ready. In a recent press release, IBM announced that it is working to create a microchip that will sequence DNA by running it through tiny ‘nanopores’. The DNA Transistor will be able to sequence the entire genome rapidly and for less than $1000. While a working prototype of the chip won’t be created for three more years, IBM thinks that the theory and computation behind the concept is sound. If ultimately successful, the computer giant would launch itself to the forefront of the genome sequencing field. For now though, the company is just pushing an idea, not a product. I love it when companies compete in a field, but IBM’s got years of hard work before it could be a genome sequencing competitor. A fact that makes their press release seem premature at best. Still, you should check out the admittedly cool PR video after the break. The first human genome cost around three billion dollars to sequence. Today, Illumina is offering to do the same for $50,000 and Complete Genomics is looking to a $5000 price tag under certain conditions by the end of next year. But the big hurdle is $1000. At that point, sequencing a genome will become accessible to almost anyone, and could see wide spread adoption in health and medicine. Using genetic information, doctors could provide personalized health care that would target illnesses and choose treatments which best suit your body. Knowing more, we could live much longer. IBM’s proposed device would work by threading a single strand of DNA through a 3 nanometer diameter pore that is drilled through a silicon chip using an electron beam. As the press release admits, that idea is being explored by several companies around the world (including Agilent, Sequenom, NabSys, and Oxford Nanopore Technologies). The IBM innovation is to slow the progress of the DNA through the nanopore by using electric fields as gates. By controlling the speed at which the DNA moves, IBM hopes to read the strand. That reading would be accomplished by measuring the variation in electric potentials across the pore, which is uniquely different depending on if the base is A, C, T, or G.
Strands of DNA suspended in a solvent would be encouraged to pass through the nanopore due to an electric bias. Electric fields in the pore would control strand movement and read the DNA. When I first looked at the IBM video describing the DNA Transistor, I thought, “I’ve seen this before.” I interviewed DNA Electronics CEO Christopher Toumazou about the combination of CMOS technology and genetics last month. The SNP Dr is a hand held silicon chip based device that reads DNA to find interesting genetic sequences. Unlike IBM’s device, it’s already been made and tested. But there are big differences between the two devices besides the fact that IBM’s is still on the drawing board. First, the SNP Dr looks for single nucleotide polymorphisms, the single gene variations that have important impact on physical traits, drug reactions, etc. The SNP Dr does not sequence your entire genome as the DNA Transistor plans to do. If it helps to draw comparisons to companies, the SNP Dr is like 23andMe and the DNA Transistor is more like Illumina or Complete Genomics. Secondly, the SNP Dr works by using enzymes (polymerases) to cause protons to be released as a strand of DNA is read, and the silicon chip measures that current. 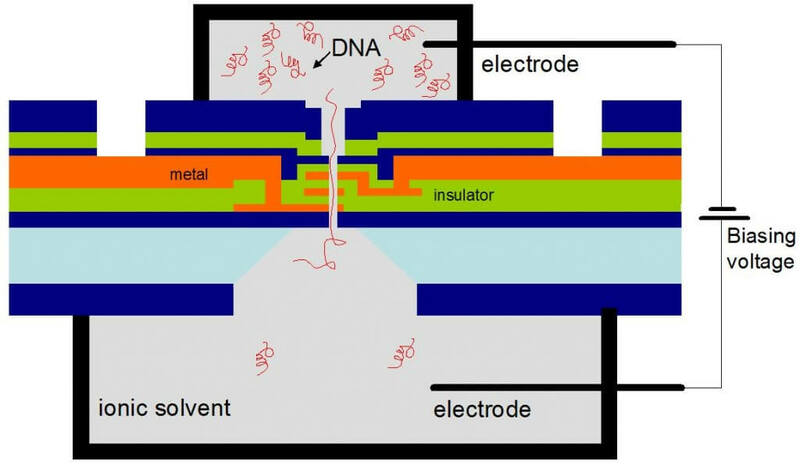 The DNA Transistor would only use electric fields to read the strand as it passes through the nanopore. So the DNA Transistor could be an important improvement over the existing SNP Dr technology, but not yet. In fact, IBM is looking to have a working prototype in three years. That seems like forever. Complete Genomics will have $5000 sequencing by the end of 2010 and it should only get cheaper thereafter. The same goes for Illumina and every other genome focused company. By 2013, the $1000 hurdle could have been jumped by one of these companies. Heck, by that time, we could see the price drop much lower. If the DNA transistor is to be competitive that far down the road it will have to be cheaper (IBM has tossed around the $100 mark as a possibility) or much much faster. Luckily for IBM, silicon technology has speed down to a fine science. I don’t know if the DNA Transistor is going to be the device that defines the next generation of DNA sequencing, but I do know that the marriage of CMOS and genetics is powerful. That’s a sentiment shared by the researchers behind the IBM device, Stas Polonsky and Gustavo Stolovitzky, in the companion video embedded below. Everything about this press release strikes me as hype. Good hype, sincere hype, but hype all the same. There’s no doubt that the combination of genome sequencing and microchip technology is a game changing idea, but IBM doesn’t have a monopoly on it. Obviously DNA Electronics has a somewhat related device already nearing market, and there are other companies also working towards using nanopores to sequence the whole genome. A lot can happen in three years. Hopefully someone will have a working prototype by that time. It could be IBM, but no matter who it is, their cheap and quick sequencing is going to change our lives.